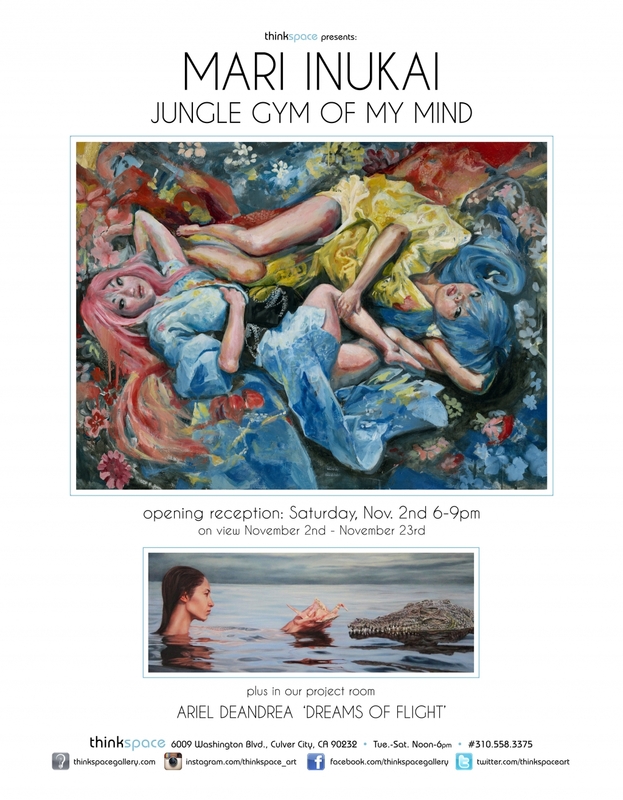 Thinkspace Gallery (Los Angeles) – is pleased to present new works by artist Mari Inukai in Jungle Gym Of My Mind. Born in Nagoya Japan, Inukai completed her art education in California, and is currently based in Los Angeles. With a BFA in character animation, the artist has successfully pursued commercial animation in tandem with her fine art practice. The duality of Inukai’s work is evident in her combination of graphic and painterly styles. At times the works are loosely rendered and portrait based, and at others they are distinctly graphic and surreal. 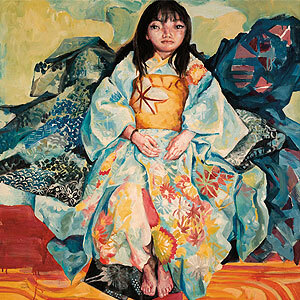 Inukai’s paintings delve into fantasy and relate an emotive personal symbolism that is at once iconic and private. Her portraits tend to be sensual, brooding and charged with a scintillating energy, while much of the graphic work is directly inspired by animation and the whimsy of childlike fantasy. The artist’s paintings are often tempered by a subtle dissonance and an interest in the coexistence of these polarities. They simultaneously evoke innocence and sexuality, play and depth, childhood and adulthood; revealing images that are beautiful, playful and at times evasive and complex. Populated by a host of re-appearing characters, like the little creatures in Inukai’s signature hats and her adorable candy colored monsters, the artist’s graphic imagery suggests a developed narrative universe unto itself. A storyline always seems to underlie the images, and the viewer is left with the impression of having fallen upon a moment in a much larger train of thought. These irresistible “super-friends” are somehow united against an unseen external threat by some binding collectivity. The symbolism in Inukai’s work is at times subtle, but the artist draws from both cultural references and the personal to relay her own imaginative vision with whimsy and intensity. Influenced by the expressive figuration of Egon Schiele, and the graphic play of Nara Yoshitomo, Inukai’s eclectic work is stylistically varied and draws from a variety of inspirations. Her figurative paintings are often striking personal portraits of her daughter Sena, painterly rendered to channel affect with great pathos and feeling. At other times her portraits are sensual renderings of beautiful women that remain mysteriously oblique and suggestive. A fine line between fantasy and reality pervades Inukai’s imagery, particularly in these figurative works. It is as though the artist experiments with a variety of personas and fantasies to explore a human coming of age, both personally and culturally. Her graphic work functions as a lighter counterpart to this more emotive body of portraiture, and is clearly influenced by her aesthetic love of Japanese film, print and anime. The two bodies of imagery, side by side, playfully suggest the synchronicity of human polarities: the whimsy of childhood fantasy in coexistence with the conflicted depth of an adult consciousness. As a result, Inukai is able to channel emotional intensity and whimsical play as one in her evocative works.